Cootie Coo Creations: Greetings and Update!! Finally, the schedule and necessary forms are ready for Cootie Coo Craziness, which will be held October 1 -3, 2010, here in High Springs, Florida. Click on the button and take a look and see if you, too, don't get excited! 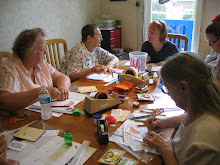 We will be having classes galore and fun activities, so plan on joining in and getting those creative juices flowing! Just to clarify things, the regular monthly class schedules are posted under "Class Schedule", so the regular activities at the shop will continue as we gear up to Cootie Coo Craziness! Don't forget that the High Springs Riverfest will be going on at the same time as Cootie Coo Craziness, so there is sure to be something going on for everyone! Have a glorious day and remember to live creatively!